Your Auction Games eBook is ready! 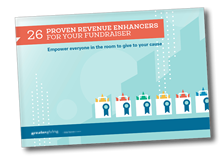 auction games eBook, "26 Proven Revenue Enhancers for Your Fundraiser", is available for download here. We have also emailed you a copy to download at any time. Best of luck at your event and let us know how these auction games work for your event! Add auction games to your fundraising event and empower everyone in the room to give to your cause with this complimentary, no cost digital download! Additionally, the lower price point of participation in these auction games makes them accessible to all your guests. This is great for people who can’t join in the big live auction bidding but still want to support your cause. This free eBook contains 26 auction games presented by the fundraising professionals that use them at their events. You'll get more than just how to run the game at your event—these pros dish on how their variations and nuances that spice up event the most well known auction games. Here are 26 of the best auction games in one easy-to-use lookbook for you.